Okay, first, it’s pah-stee, not pAy-stee. I’m talking about food. Pasties, or Cornish pasties, are self-contained meat pies. Legend has it that the pasty was brought to this country by immigrants from Cornwall, England, who came here to work in the mining industry, in the upper peninsula of Michigan and upper Minnesota. The miner’s wives made this tasty delicacy with a mix of meat, potatoes, onions, and rutabaga, wrapped in pie crust. The miners would tuck a towel-wrapped pasty into their pockets and take them to work, where they would stay delightfully warm until lunch time. Right. I can’t speak for Minnesotans, but anyone raised in Michigan, or anyone who has traveled to the upper peninsula, should know what a pasty is. Michiganders know that the best pasties are found the farther north you go of the Mackinac bridge. In fact we all heard the expression growing up “you can’t get good pasties this side of the bridge.” Today you CAN buy pasties south of the bridge, usually at local diner-type restaurants, but I contend the best ones are still north of the bridge (Houghton maybe) although we have found good pasties in St. Ignace, just across the bridge, at a mom and pop store that sells pasties, fudge, magazines and bait. My husband’s family got their pasty traditions from the family roots in Duluth, Minnesota. Shortly before we were married, my future mother-in-law schooled my husband and me in the art of making pasties, thinking she couldn’t let her first-born son starve to death with a wife who didn’t know how to make a pasty. There was no recipe – just Mom’s tutelage in making and rolling out the dough, spending what seemed like hours dicing up meat, potatoes and carrots (no rutabaga in this family’s pasties), filling the crust, trimming and baking. 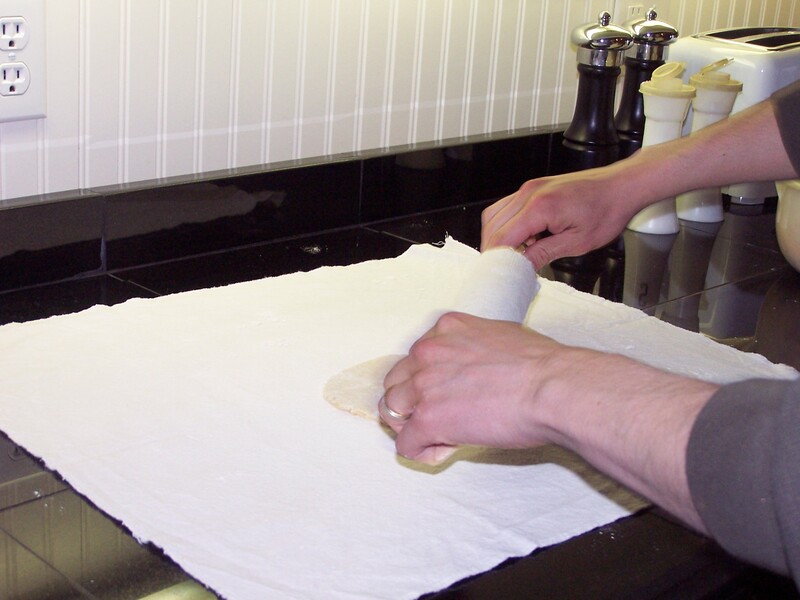 Since that day many years ago I’ve added my own refinements – I no longer trim the dough into a neat half-circle as my mother-in-law did – it just wastes dough and time and adds nothing to the finished product. I now use one pat of margarine instead of two (cholesterol conscious I guess) and cut the prep time at least by half by chopping all the ingredients and making the dough in the food processor. Things aren’t diced as evenly and prettily, but hey, I’ve got better things to do than standing in the kitchen dicing half the day. And it still tastes great. Recently, best husband and I passed on the tradition by teaching our first-born son how to make pasties. 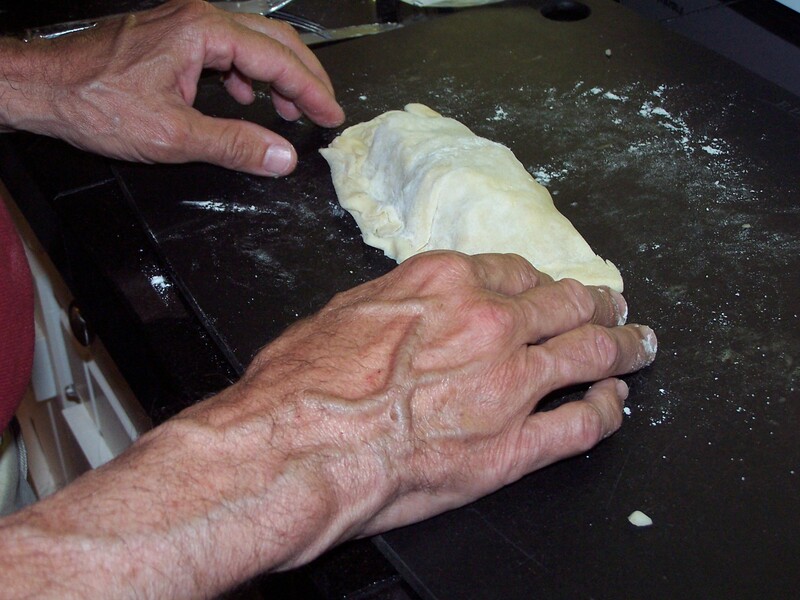 Besides explaining the basics, we passed on all the little tips that we’ve gleaned from making pasties over the years. I feel better knowing that someday when I die, I will have at least passed on the secret nuances of pasty-making that one will never learn from reading a recipe, hopefully to be passed on again and again, so the family pasty tradition will remain alive. 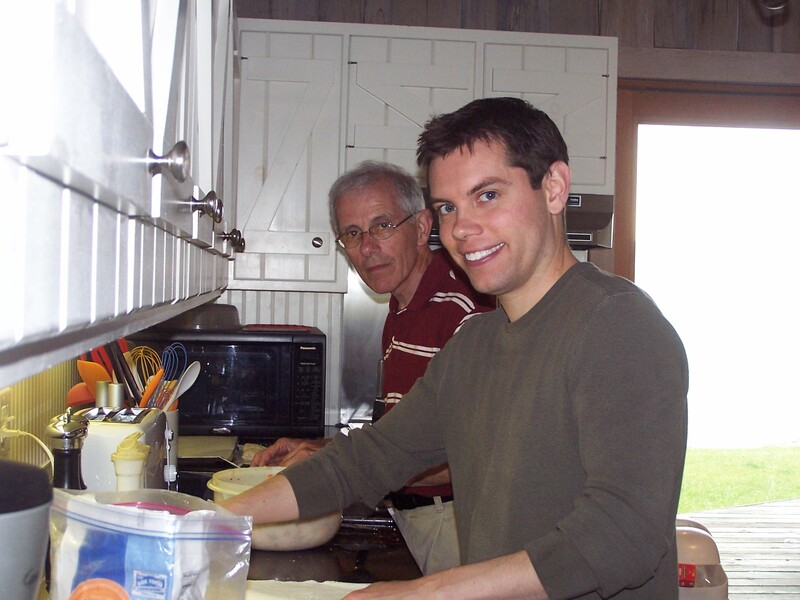 Two generations of pasty makers: husband and first-born son. This entry was posted in Family, Food, HuffyHow and tagged Baking, Cornwall, dinner, entree, Food, foodpress, main dish, Michigan, Pastie, Pasty, postaweek2011, St. Ignace Michigan, Upper Peninsula of Michigan by Huffygirl. Bookmark the permalink. Can’t wait for the recipe. I ate my very first pasty in Scotland from the Cornwall Pasty Company. I’ll be going to England next month and can’t wait to inhale a few. I’d be curious to know how the genuine Cornish pasties compare to the ones we can buy in Michigan, and to the ones I make at home. Maybe I’ll have to mail you a pasty when you get back so you can do the comparrison taste test! Yes, I love it too. I took the pictures, they did the cooking! I’ve never had one so I loved reading this. Will look forward to the recipe thought it looks like more than I might want to attempt! It’s not as bad as you might think especially since I’ve streamlined Mom’s recipe. And if you can make it with a partner it goes even faster. I’ll try to get the recipe part out Wednesday or Thursday. Thanks for setting me straight on the pronunciation. I never would have known. Sounds like something in the same category as a kanish.